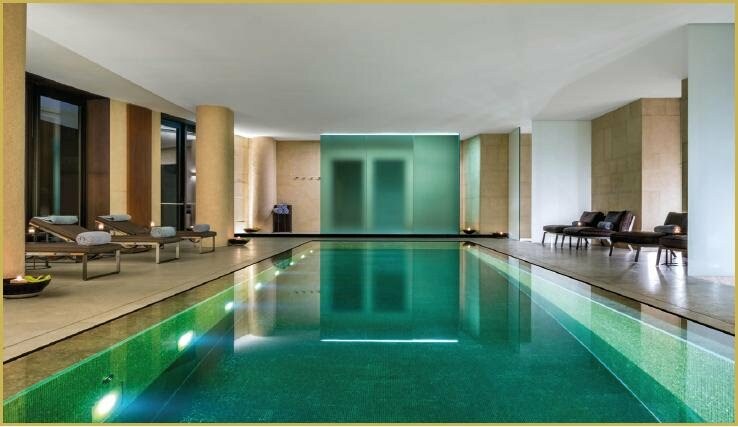 The Spa at the Bulgari Hotel has been conceived as an urban shelter for the mind and the soul. The main hall is dominated by a long swimming pool, tiled with a shining gold and emerald mosaic, with the minimalist Hamam at the end. The Hamam represents a shelter of private and precious well-being and is entirely surrounded by glass of the same green as the pool and furnished with Aphyon stone seating. The Spa overlooks an openair lounge through a bright glass window.